A few years after Henry Bennion Eyring became president of Ricks College (now Brigham Young University–Idaho), he was offered a high-paying, prestige-filled job in southern California. He called Jeffrey R. Holland, then Commissioner of the Church Educational System, and told him that he had turned down the job offer. That evening Henry received a phone call from President Kimball. “I understand you’ve decided to stay,” said President Kimball. “Do you think you’ve made a sacrifice?” asked President Kimball. “That’s right!” President Kimball assured him. With that, President Kimball ended the conversation. For those who know Henry B. Eyring, his willingness to follow spiritual promptings﻿—even if doing so means giving up what the world considers important﻿—comes as no surprise. He has learned for himself that faith and humility, coupled with obedience, qualify God’s children for blessings richer than worldly wealth. Following the death of President Gordon B. Hinckley on January 27, 2008, President Thomas S. Monson called President Eyring to serve as First Counselor in the First Presidency. President Eyring had previously served as Second Counselor for four months, filling a vacancy created by the death of President James E. Faust. “Hal”﻿—as he is known among family and friends﻿—was born on May 31, 1933, in Princeton, New Jersey. The second of three sons born to Henry Eyring and Mildred Bennion Eyring, he joined a family that put a premium on both spiritual and secular schooling. His father was a renowned chemist teaching at Princeton University. His mother, an assistant professor who headed the women’s physical education department at the University of Utah, was on leave from the department pursuing a doctoral degree at the University of Wisconsin when she met her future husband. Together they passed on to their sons their trust in the Lord and their faith in His gospel. Great-Grandfather Eyring met Swiss immigrant Mary Bommeli when he joined her pioneer company on his trek to Utah following his mission. Mary, whose family joined the Church when she was 24, had been incarcerated in Berlin, Germany, for sharing the gospel. The night she was arrested, she wrote a letter to the judge who was to hear her case. She told the judge, “a man of the world,” about the Resurrection and the spirit world, encouraging him to repent in order to save himself and his family from “great sorrow.” The judge soon dropped the charges, and Mary was released from jail.2 Henry and Mary married shortly after reaching the Salt Lake Valley. From Europe to the deserts of southern Utah and Arizona to the colonies of northern Mexico, President Eyring’s ancestors tamed the wilderness, spread the gospel, fled persecution, established schools, and educated their children. With the onset of World War II, gasoline rationing prevented the Eyring family from making the 17-mile (27-km) drive to the New Brunswick Branch for Sunday meetings. As a result, the family received permission to hold meetings in their home, in Princeton, New Jersey. Hal would joke that he never missed a Primary meeting there﻿—an achievement that wasn’t too difficult considering that Primary was held only once in their home. President Eyring often reflects on the beautiful spirit in the sacrament meetings held in this small branch, made up of his family and occasional visitors. He didn’t mind that his family were usually the only ones who attended or that he and his brothers constituted the branch’s entire Aaronic Priesthood. But as the boys began entering their teenage years, their mother was eager for the family to live among a larger concentration of Latter-day Saints. In 1946 Henry was enjoying his success and work at Princeton. He had won numerous honorary doctorates and most major awards in chemistry. Given his diligent scientific work with world-renowned scientists, he had an excellent opportunity to be considered for a Nobel Prize. At about this time Henry received a call from A. Ray Olpin, president of the University of Utah, inviting him to be the dean of the graduate school there and continue his research in chemistry. His wife, Mildred, left the decision up to Henry, but she reminded him of a promise he had made to her years earlier. Henry had promised to move his family closer to Church headquarters when the boys got older. When Henry turned down the offer, Mildred, who had grown up in Utah, asked him to pray about his decision and gave him a letter to read when he arrived at his laboratory. Upon reading the letter, in which Mildred expressed her disappointment, and after praying and pondering, Henry called President Olpin, saying he would accept the position after all to build up the university’s science department. His apparent sacrifice in leaving Princeton turned out to be a blessing for him and his family. One such blessing was Hal’s willingness to follow his father’s example when he faced a similar crossroads years later. “I realized when my brother was a teenager how different he was from other teenagers,” says Harden Eyring, who calls his older brother both a mentor and a friend. While Hal was in high school, Harden says, he immersed himself in the scriptures, reading the Book of Mormon five times. Hal did not hold himself above others, but he refused to participate in activities that would distract from his spirituality. He made time to play basketball for East High School in Salt Lake City, but he put priority on his studies. As he grew older, however, Hal discovered a major difference between himself and his father. Henry Eyring encouraged his sons to study physics and to prepare for a career in the sciences. Hal dutifully majored in physics at the University of Utah, but one day when he asked his father for help with a complex mathematical problem, it became apparent to Henry that Hal did not share his passion. Hal nevertheless completed his degree in physics in 1955 before entering the U.S. Air Force. The Korean War had recently ended, and the number of young men called as full-time missionaries from each ward had been restricted. For a period of time the Mission Home in Salt Lake City was closed, and no missionaries went into the field. In a blessing, however, his bishop promised him that his military service would be his mission. Two weeks after arriving at the Sandia Base near Albuquerque, New Mexico, Hal was called as a district missionary in the Western States Mission﻿—a calling he fulfilled in evenings and on weekends during the two years he was in the military. His military obligation fulfilled, Hal enrolled in the Harvard Graduate School of Business, where he earned a master’s degree in 1959 and a doctorate degree in 1963, both in business administration. Though he had the intellect to succeed in a career in science, Hal found that his passion lay in teaching, lifting, and strengthening others. While attending Harvard during the summer of 1961, Hal met Kathleen Johnson, the daughter of J. Cyril and LaPrele Lindsay Johnson, of Palo Alto, California. She was attending summer school in Boston, and Hal was smitten the first time he saw her. He felt an immediate desire to do his best when he was in her presence﻿—a feeling that has continued throughout their lives together. They dated that summer and continued their courtship through phone calls and letters after Kathleen returned to California. They were married in July 1962 in the Logan Utah Temple by Elder Spencer W. Kimball. That same year Hal became an assistant professor at the Stanford Graduate School of Business. Neal A. Maxwell had just been appointed Commissioner of the Church Educational System. Neither Hal nor Kathleen knew him, but Kathleen felt that perhaps her husband could be doing more to change lives. Hal was shaken by the experience and immediately returned home. “We’ve got a problem,” he told Kathleen. He feared he had made a mistake by passing up several job offers he had received while at Stanford. “I had never prayed over any of them,” he says. Humbled, he began praying about his future. Even his wife’s prompting and the spiritual rebuke he had received hadn’t prepared him for such a surprise. He told Commissioner Maxwell that he would need to pray about it. After all, he knew little about Ricks College. The next morning he met with the First Presidency. Afterward, Commissioner Maxwell told him the job was his if he wanted it. Just like that, Hal gave up the trappings of tenure at Stanford for life in a single-wide trailer in Rexburg, Idaho. It would be several months after his inauguration as president of Ricks College, on December 10, 1971, that he would move his family into their new home, which he helped build. The six years President Eyring spent in Rexburg proved to be a blessing to his family and the college. Wise counsel from a humble home teacher helped make those years memorable. The home teacher, a farmer with great faith, encouraged President Eyring to get out of his office so he could meet, encourage, and give gratitude to college faculty, staff, and students. Hal prayed about the matter, felt prompted to follow that counsel, and began spending more time with the school’s faithful students and dedicated faculty and staff. With another instructor, he even taught religion classes. As he worked hard to shape the college’s spiritual and academic foundations, he and Kathleen grew to love the campus community and the people of Rexburg. During their years in Rexburg, Eyring family members grew closer to each other. By then Hal and Kathleen had four sons: Henry J., Stuart, Matthew, and John. Later they would be blessed with two daughters: Elizabeth and Mary Kathleen. But even in a small, rural farm town, Hal and Kathleen had to be vigilant. One of their concerns was the amount and quality of television programming that their sons watched. Henry J., the oldest son, recalls an experience that made a significant difference in the spirit of the Eyring home. Unnerved, Henry J. headed to bed. His innovative brother, however, cut a cord from a broken vacuum and connected it to the television. Soon the boys had plopped back down in front of the television, hardly missing any of their show. President Eyring still credits his wife for giving him a desire to do and be his best, and he’s grateful that she has blessed her children in the same way. He is quick to credit her for her example and spiritual influence on their family. She is equally complimentary, expressing gratitude for his sensitivity to the Spirit and the effective way he has taught and lived the gospel in their home. With no television in the home, family members had more time for each other and more time to pursue interests, develop talents, and engage in sports and other activities as a family. Over the years President Eyring has honed his cooking skills (he makes his own bread), discovered a knack for woodcarving, and learned to paint with watercolor. On occasion he will send a thank-you note or a watercolor painting as a remembrance. Today the Eyring home is full of paintings, carvings, and furniture that he has created with the help of skilled mentors. Many of the pieces reflect moral lessons or spiritual impressions. In addition, he makes time to send daily e-mails, affectionately known as “The Small Plates,” to his family, which now includes 25 grandchildren. “Dad’s family journal, which he sends out via e-mail each day with photos and contributions from the children, has helped us feel as though we were telling stories around the dinner table each night,” says Henry J. President Eyring didn’t know it at the time, but he left secular employment behind him when he accepted the position at Ricks College. His work as college president and simultaneous service as a regional representative and member of the Sunday School general board brought him into increased contact with leaders of the Church, who recognized his talents and spiritual gifts. The Lord, meanwhile, knew his willingness to serve. In extending the important callings to President Eyring that followed his six years at Ricks College, Church leaders sought inspiration that led them to him. During a period of preparation for those callings, he was tutored by the Spirit as he worked, sought the will of heaven, listened for answers, and, like his ancestors, acted on the promptings that followed. When the calls came, he was ready. In 1977 Jeffrey R. Holland, new CES commissioner, asked President Eyring to serve as deputy commissioner. Three years later, when Commissioner Holland became president of Brigham Young University, Hal took his place as CES commissioner. He served in that position until his call in April 1985 as First Counselor in the Presiding Bishopric. In that calling he used his many abilities to make significant contributions in administration, physical facilities planning, temple design and construction, and other temporal affairs. In September 1992 he was renamed CES commissioner and, a month later, was called to the First Quorum of the Seventy. On April 1, 1995, Henry B. Eyring was sustained to the Quorum of the Twelve Apostles. Since then he has sought an increased portion of the Spirit of the Lord as he has blessed members of the Church throughout the world with his heartfelt sermons, loving ministration, and powerful testimony of the Savior and His gospel. President Eyring has always lived the precepts of the thirteenth article of faith. Members of the Church are indeed fortunate to have him serve at the side of President Thomas S. Monson and President Dieter F. Uchtdorf. A rare combination of talents, a heritage of faith, a life of preparation, a dedication to service, and a determination to seek God and do His will uniquely qualify him to serve in the First Presidency. See Henry J. Eyring, Mormon Scientist: The Life and Faith of Henry Eyring (2007), 127–30. 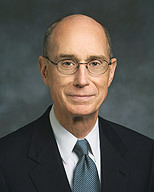 See Henry B. Eyring, “The Power of Teaching Doctrine,” Liahona, July 1999, 87–88; Ensign, May 1999, 74–75. In Gerald N. Lund, “Elder Henry B. Eyring: Molded by ‘Defining Influences,’ ” Liahona, Apr. 1996, 28; Ensign, Sept. 1995, 12. Henry B. Eyring, “O Remember, Remember,” Liahona and Ensign, Nov. 2007, 67. Opposite page, from top: President Eyring’s family (from left)﻿—his father, Henry; brothers, Ted and Harden; young Henry, or “Hal”; and mother, Mildred. Hal, from a 1951 high school yearbook. Right: Great-grandparents Henry Eyring and Mary Bommeli. Opposite page: President Eyring’s parents and a 1969 portrait of his father. Above: While serving as president of Ricks College. Left: With his wife, Kathleen, at their wedding reception. Above left: As president of Ricks College, presenting the Exemplary Woman of the Year Award to Sister Donna Packer, 1973. Also pictured are President Boyd K. Packer and Denece Hansen Johnson, then president of the Associated Women Students. Above: As a member of the Quorum of the Twelve Apostles, 1997. Right: During a recent visit to southern Utah. Far right: With Elder M. Russell Ballard of the Quorum of the Twelve Apostles during a June 2004 worldwide leadership training meeting. Opposite page: Family portrait, 1995 (seated, from left)﻿—Mary Kathleen, President and Sister Eyring, Elizabeth; (standing, from left)﻿—John, Matthew, Stuart, and Henry. Opposite page: A printout of the family’s “Small Plates,” a wood chest carved by President Eyring, and some of his watercolor paintings. Above: With his wife, following general conference, October 2007. Left: The First Presidency﻿—President Thomas S. Monson (center); President Henry B. Eyring, First Counselor; and President Dieter F. Uchtdorf, Second Counselor.